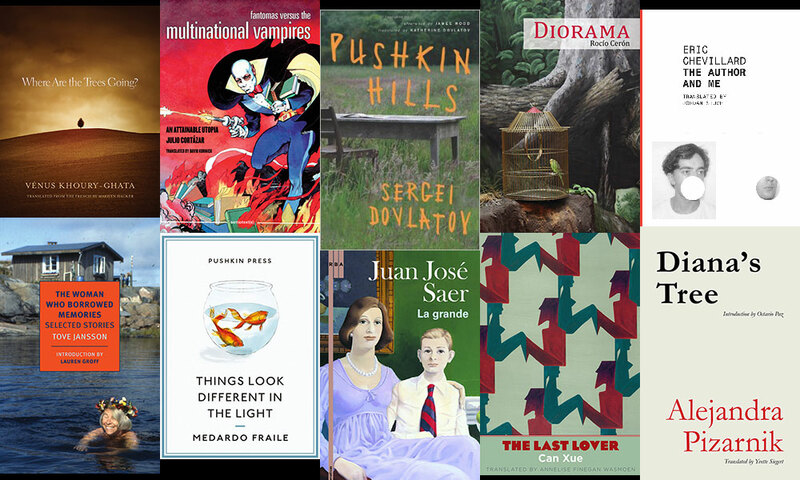 Ten works of fiction and six poetry collections remain in the running for this year’s Best Translated Book Awards following the announcement of the two shortlists today on Three Percent, the University of Rochester’s translation-centric website. The 16 finalists—consisting of well-established writers like Elena Ferrante, Julio Cortázar, Can Xue, Sergei Dovlatov, Valeria Luiselli, Bohumil Hrabal, Lev Rubinstein, Vénus Khoury-Ghata, Alejandra Pizarnik, and seven more—were selected from the almost 600 works of fiction and poetry published in English translation for the first time during 2014. As in recent years, the Best Translated Book Awards are underwritten by Amazon.com’s giving programs, which allow both winning authors and winning translators to receive $5,000 cash prizes. The winners will be announced at 2:30 p.m. EST on Wednesday, May 27, as part of BookExpo America in New York City. Several fiction and poetry judges will participate on the panel, which will take place on the Eastside Stage. A celebration of the award will take place that evening at 5 p.m. at The Folly on 92 W. Houston St.
Past winners of the fiction award include: Seiobo There Below and Satantango, both by László Krasznahorkai, and translated from the Hungarian by Ottilie Mulzet and George Szirtes respectively; Stone Upon Stone by Wiesław Myśliwski, translated from the Polish by Bill Johnston; and, The True Deceiver by Tove Jansson, translated from the Swedish by Thomas Teal. Jansson and Teal are the only author and translator on this year’s fiction shortlist who have previously won the award. Past winners of the poetry award include: The Guest in the Wood by Elisa Biagini, translated from the Italian by Diana Thow, Sarah Stickney, and Eugene Ostashevsky; Wheel with a Single Spoke by Nichita Stănescu, translated from the Romanian by Sean Cotter; and Spectacle & Pigsty by Kiwao Nomura, translated from the Japanese by Kyoko Yoshida and Forrest Gander.